The Star Trek World Tour was planned as the name says a travelling Exhibition. It Started in “Düsseldorf” in Germany, moved to Vienna and then to Asia. 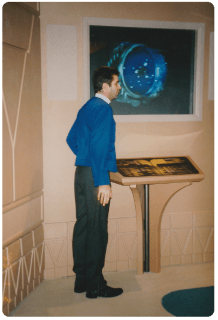 It was 1998, after reading the first announcements I couldn’t believe it, it was too expensive for me to visit Las Vegas and the Star Trek Experience, so there was a Star Trek Tour coming to Düsseldorf. This is about 10-12 hours train ride or 1.5-hour flight. Flying was too expensive at this time – no Low-Cost Carriers, so we took the night train to Germany. I visited the tour at the beginning and again at the end. At the end, I was on the very last flight of the “Enterprise” in Düsseldorf, and this flight was an amazing experience – the crew made a lot of fun. During the tour in Düsseldorf they made some changes, the first thing was, that at the beginning of the tour the movie was in English, and the translations weren’t ready on the first days. They also changed the movie on the bridge. I’m glad that I was visiting the tour also on the first days so I was able to see both movies. They also changed the “beaming effect” a bit. I talked to some people who worked there, and they said, that some guest complained, that the effects were too intense. 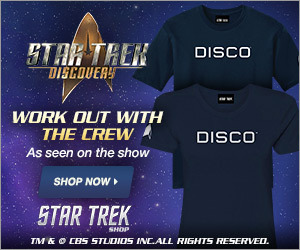 You got some basic information, about Star Trek. Sometimes there were also some Klingons in the room, who made a lot of fun with the guides and the visitors. After that, you were guided to a small briefing room. In the briefing room, Q appeared on the screen with his son Maurice. He would like to show his son the Humans. 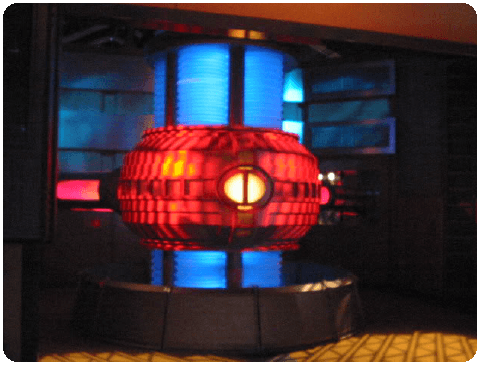 Our guide explained something about the transporter, and how it works – but Q interrupted him and opened the door to the transporter room. So we should all step on the platform. 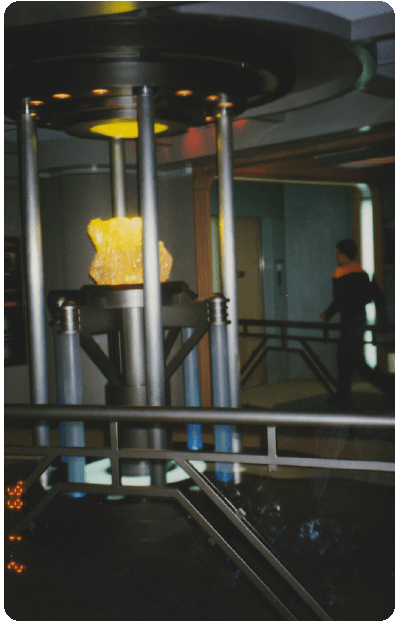 This was the transporter platform – I have a better picture of the Star Trek Adventure. The Transporter Effect was made with flashes, bass-shakers and sound. Q was also a bit talking to us, he tries to scare some people about beaming. You can see it in the video, sometimes they picked some people and told them, that they didn’t warn the crowd that the transporter had a maximum capacity of 10 persons. The video is only in German – sorry for that. After the Transporter room, we arrived at Main Engineering. Q was also there on a screen. 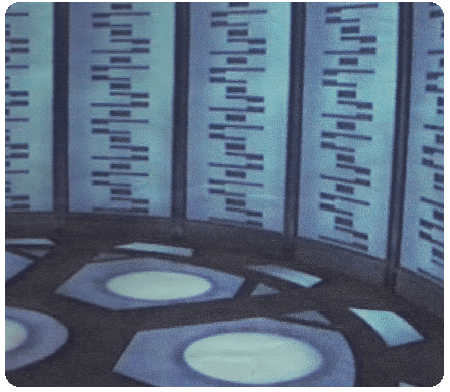 He simulated a warp core breach and all people were evacuated to another room. It should be a labour or something like that. While waiting for the turbolift we were standing in this room. I don’t have pictures from the turbolift, but you can see the ride on the video. The lift took us up to the bridge. First, the pictures on the bridge are from the World Tour and the ST-Adventure. After the World Tour vanished in Asia – some years later the Star Trek Adventure opens in London (I was also there) The used the sets from the World Tour for the Adventure. 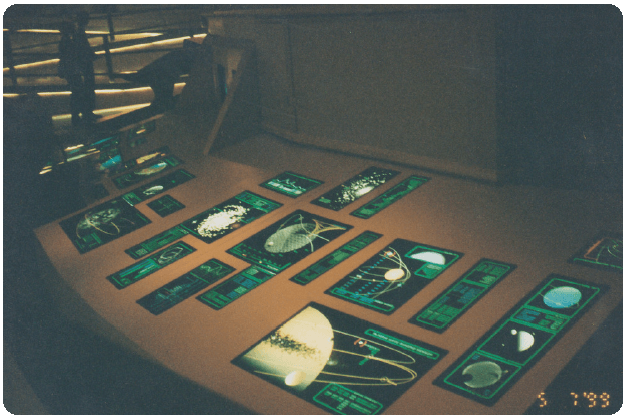 (This explains the pictures without Starfleet officers at Engineering or the Ops / Conn on the bridge. At the bridge, Q appeared again and there was a fight against the Borg. 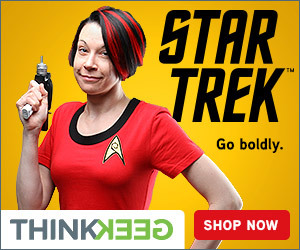 You can see on one picture the Enterprise-E. It was a lot of fun standing on the bridge. These rides are very popular at amusement parks. 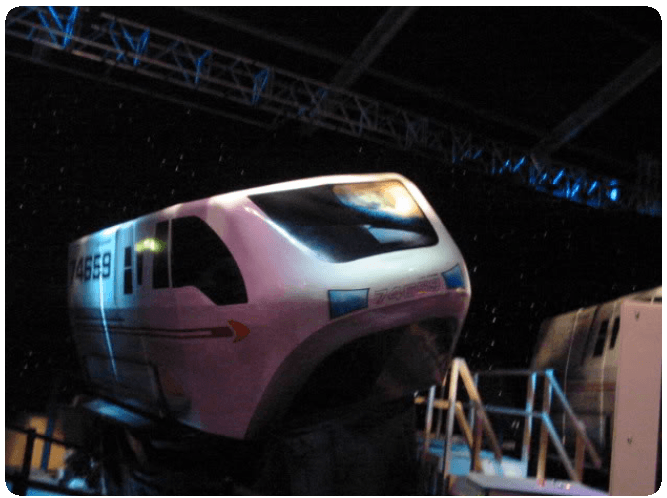 After visiting the bridge, you were escorted to the shuttlebay and fly back to earth. At Düsseldorf, there wasn’t a shuttle ride, but at Vienna, they added this ride. The fun stuff was that the shuttle was landing in “Cologne” a city near Düsseldorf. 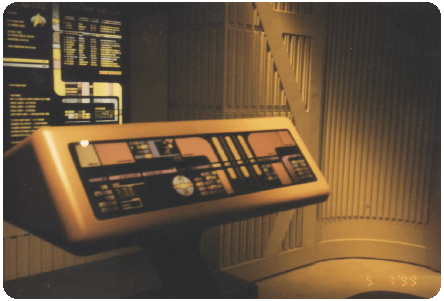 6th February 2017 Treksphere Guest Author Comments Off on To Boldly Go Where No One Has Gone Before…Again.